The fear of laptop bomb has triggered off the electronics ban onboard airplanes entering the United States of America (USA) and lately United Kingdom (UK), reports ITRealms. The new rules, ITRealms gathered has been confirmed by US Department of Homeland Security and UK authorities’ ban, both linked to suspected plans by terrorist groups based on intelligence report. 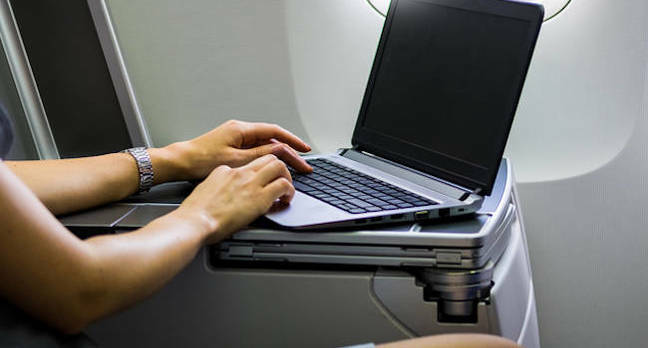 Britain, according to PA, has taken the dramatic move to ban laptop computers and tablets from the cabins of planes flying to the UK from six countries, amid fears of a new terror threat. The move affecting thousands of passengers coming from six predominantly-Muslim countries mirrors a similar measure imposed by the US, citing an attempt by the Islamist al-Shabaab group to bring down a jet in Somalia using a laptop bomb. The British Government’s decision follows the receipt of specific intelligence reports, according to security sources. Downing Street officials refused to discuss any specific terrorist plot, but action hitting 15 airlines with the extra restrictions was taken after Theresa May met aviation experts on Tuesday morning. Ministers said they understood the “frustration” the extra measures would cause passengers but said they are working with the industry to minimise the impact. A No 10 spokesman said: “The safety and security of the travelling public is our highest priority. The six countries affected are: Turkey, Lebanon, Jordan, Egypt, Tunisia and Saudi Arabia. Devices measuring more than 16cm in length, 9.3cm in width, or 1.5cm depth will be banned from the cabin and need to be placed into hold luggage and checked-in before going through security. Also, Downing Street said the measure was effective immediately, but would not give details as to why the decision had been taken now. No 10 did say UK security services have been “in close touch” with their US counterparts during the decision to implement the ban. The US electronics measure, announced late on Monday, affected nine airlines flying from 10 specific airports in Jordan, Egypt, Turkey, Saudi Arabia, Kuwait, Morocco, Qatar and the UAE, including Dubai, the world’s busiest airport for international travellers. An incident last year appears to have caused particular alarm, after al-Shabaab smuggled an explosive-filled laptop on a flight out of Mogadishu. The explosion was small, but the bomb was particularly placed by the extremist so as to blow a hole in the side of the passenger cabin. Experts said that if the plane was at a higher altitude, the small blast in the passenger area could have triggered a bigger explosion due to the pressurised cabin and caused the jet to crash.